Rust Out maintains the performance of water softeners on iron bearing water. Rust Out chemically removes iron and rust build-up that has coated the beds and fouled the softener. Since this build-up is not completely removed during normal regeneration of a water softener, using Rust Out will eliminate rust and foreign matter from the resin bed. This increases the life of the water softener in addition to reducing the amount of rust stains on household fixtures and other surfaces. Using the Rust Out rust remover regularly as preventative maintenance will ensure the softening and recharging efficiency of the water softener's resin bed. 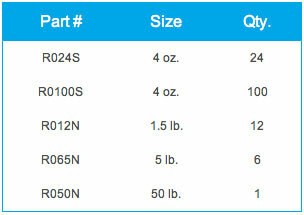 Available in 4 oz, 1.5 lb, 5 lb, & 50 lb sizes. Water Softeners: Rust Out water softener rust remover dissolves iron the in the mineral bed and is rinsed from the softener much like salt brine. First Application: Dissolve 1 oz in 1/2 gallon of cold water. Pour the solution directly into the brine well of the softener. For softeners without a brine well, pour the solution directly into the salt tank when the salt level is low. Manually regenerate softener. Repeat if necessary. Preventative Maintenance: Add 1/4 cup of Rust Out for every 40 lbs. of salt added to the brine tank. Layer to ensure a continuous dose with each manual regeneration. 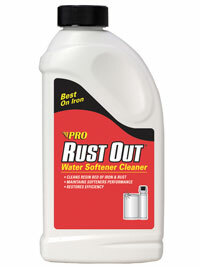 General Purpose Cleaning: Rust Out softener rust remover works on dishwashers, dishes, glassware, fabrics, and water softeners. See the back of the package for instructions.